When the administrator entered the house it became obvious that several families were living under the same roof. In all there were nine school age children in this home and our educator was drawn to talking with the students. The students were unaware that this adult had any connection with the school district and they talked freely about their experiences in school. After listening for quite some time the administrator told the elementary age students that he knew their principal and that the principal told them that she loves them. The eyes of the young children lit up. They exclaimed, “You know our principal? And…she loves us!” The words struck a chord with the children and they were obviously proud of this statement. But, here’s the part that really resonated with me. A high school age student from the house was standing nearby and overheard this conversation. She said to our administrator “ Sir, I went to that elementary school just three years ago, do you think she knows me and loves me too?” The question was asked with total sincerity and with the hope that the answer was the same. Our administrator assured her it was indeed. As a school district our job is to help all of our students learn and grow to their full potential. But sometimes that job begins simply. Sometimes it begins with knowing that the principal (or other trusted school staff) loves you and cares about you. It’s not just our elementary age students that need to know this. It’s all of our students. Our high school students need the same love and attention that our elementary students need. They won’t always express that need in appropriate ways but the need is real and the desire for connection is the same. As a school district we’re committed to being kind to kids. We’ll hold them to high standards, we’ll push them to achieve, sometimes we’ll have to discipline them, but we’ll work to make sure they know that in everything we do, their schools care about them and want what’s best for them. That’s our goal this holiday season and throughout the school year. In Worthington we offer an amazing array of co-curricular options for our students. Many happen because someone in our community chooses to volunteer their time and efforts. I was reminded of this recently while attending the John Blaine Invitational Elementary Cross Country meet at Colonial Hills Elementary. On a cold, November Saturday morning several hundred elementary students from across Worthington, and from as far away as Marion Pleasant, gathered at the Colonial Hills South Field. For several years Colonial Hills has been the gold standard for elementary cross country. Physical education teacher, John Blaine, encourages his students to run at every recess. Parent volunteers, Suzanne Guy and Rachael Estepp, have taken the baton and have made elementary cross country into a full season. On this morning the spiral mile was well marked and the spectator area was flagged off and jammed with parents sporting stocking caps and cradling their warm coffee. There were t-shirts for sale as well as the ability to purchase a pancake breakfast. The students went off in heats for their race by grade level and whether they finished first or one hundred and first they were encouraged the entire way. This year Evening Street Elementary created their inaugural cross country team. The team was organized and coached by parent volunteer Stephan Cooke. Mr. Cooke organized practices, sent reminder emails to parents, purchased neon green t-shirts for the kids to run in and generally went about corralling 50 or 60 K-6th grade students. It was a big job and without his decision to volunteer a team for Evening Street likely would not have happened. 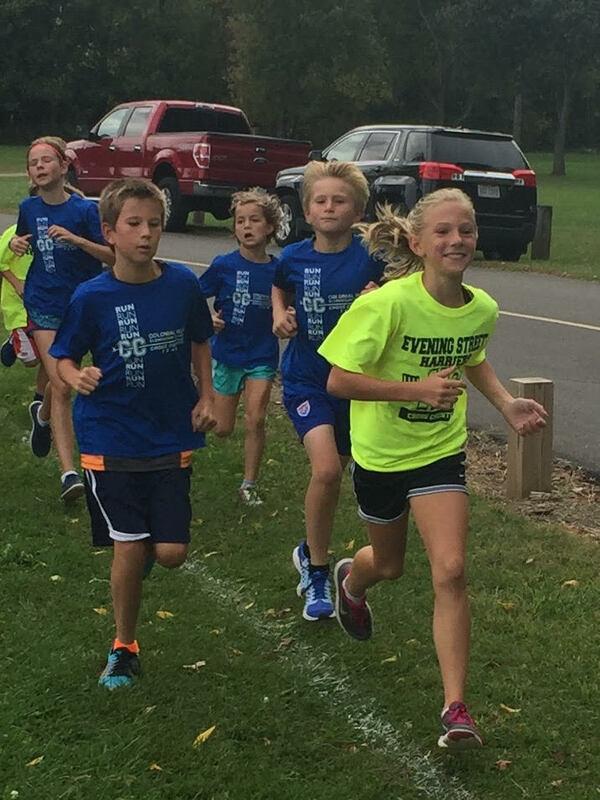 Because of volunteers like Suzanne Guy, Rachael Estepp, and Stephen Cooke, several hundred students ran elementary cross country in Worthington this fall. It may not be cross country at your school but at every one of our Worthington Schools this week someone is volunteering and something good is happening for our kids because of it. Please take a few minutes this November and thank them! It’s Worth It! Nothing is more important than the safety of our students. Unfortunately, we live in difficult times and dealing with potential threats has been part of the public experience. Sadly, we’ve dealt with this at both of our comprehensive high schools this fall. This week, we had two incidents occur that have caused us great concern and are now creating rumors throughout the community. Here’s what happened and where we are at this point. On Monday afternoon, a staff member at TWHS thought he saw a male student flash a gun out of a car window as he was leaving campus. The staff member was uncertain of exactly what he saw but immediately reported it to school administration. 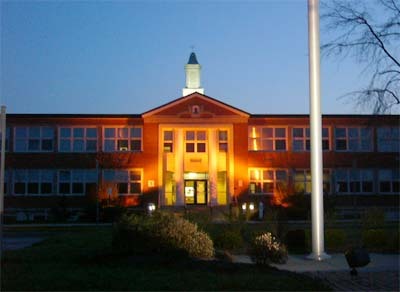 In an abundance of caution the administration immediately referred the situation to the Worthington Police Department. The police not only came to campus to take a report, but they went to the home of the student in question that evening to investigate. As of this writing I cannot be certain whether there was a weapon on campus or not. But we have treated the situation like there was and the student is not allowed on campus at this time. Also on Monday, we were alerted by a parent that his child had heard another student had posted a picture on Instagram that looked like a threat. The student had not actually seen the post but had heard about it. We talked with several students and none had seen the post, but they had heard about it. Again, using an abundance of caution we reported this to the Worthington Police. Again, they acted proactively and went to the home of the student. The police were able to confirm that there was a post on Instagram but the student was adamant that he had not intended to make a threat. From a school standpoint we don’t take chances and this student is also not allowed to be on campus. All day Tuesday the Worthington Police provided extra support at school. We did not have any expectation that the police presence was needed, but we felt like taking every proactive step possible was the right move. In addition, Mr. Gaskill sent out communication to all TWHS families about the potential weapon on campus. Tuesday and Wednesday were quiet school days without any issues that were outside the norm. Last night students began to share with one another that there was a potential threat. Our administration spoke with many students and determined that the threats described were just variations of the actual events from Monday. As students shared with one another, the rumors grew and parents became uneasy. Eventually the rumors made their way to social media and a large segment of our community became concerned. I began to receive texts and phone calls from people I know alerting me to the potential threat. We again contacted the Worthington Police and as of this writing we have no evidence to believe there was any additional threat. But, yet again, our police presence at the school has been stepped up to assure parents and students that school is a safe place. In our society today every school district is forced to deal with these issues. In this case I was very thankful that our Worthington students and parents were proactive and reached out to tell us about potential threats. It’s critical that we all partner together to make sure our kids are safe. Furthermore I’m thankful that our police department has been an outstanding partner. They have followed up on everything we have asked and they continue to provide support. We are in school today and we believe school is a safe place for our children. As a district we will not tolerate weapons or threats of any kind and we will make certain that if students make those choices there will be significant consequences. If threats occur it’s important that our students and families continue to alert us immediately. You can be assured that we will take them seriously and we will do everything possible to keep our schools safe. 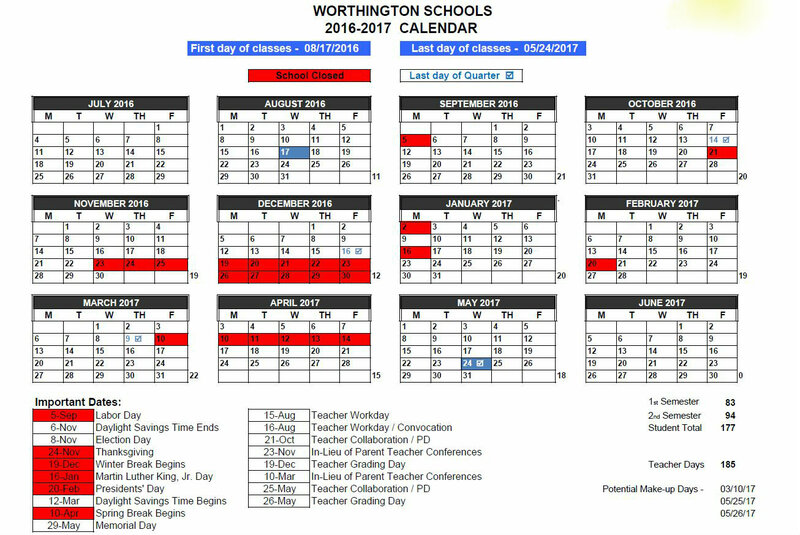 At the Wednesday, November 11th regular Worthington Board of Education meeting we will approve school calendars for the 2016-2017 and 2017-2018 school years. In creating a school calendar there are many variables that need to be considered. The most public variable is when the school year begins and when the school year ends. 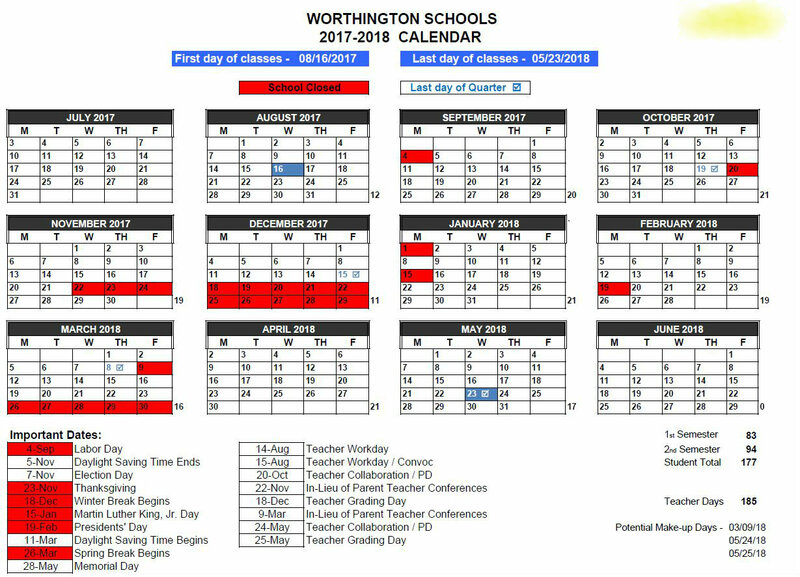 In Worthington, we began August 19th this school year and when these calendars are approved we will be scheduled to begin August 17th next year and August 16th in 2017. We’ll end both school years around May 24th. The proposed calendars mirror the calendar from this school year. The calendars have very few Friday’s and Monday’s off that are not holidays and they are free from late starts and early releases. We believe this consistency is good for our students and helps our families. In addition Ohio Revised Code does set legal requirements for the time students should spend in school. In Worthington our community expectation is that the minimum is not good enough, thus our students will spend significantly more time in school than the state requires. Under ORC the elementary school year must be at least 910 hours. The secondary school year must be at least 1001 hours. Using the most conservative calculations possible the Worthington elementary year will be 1,049 hours or roughly 24 days over minimum. The Worthington secondary year will be 1,176 hours or roughly 27 days over minimum. Finally, the school calendar is personal. Some families love going to school in August because high school students in co-curriculars are already practicing and thus vacationing then is not possible. Conversely some families believe we should start after labor day in order to preserve more family time. Some families like having as many five day school weeks as possible, others would rather see some more breaks for students and a less compact school year. While these proposed calendars may be viewed differently depending on your personal circumstances or the age of your students, we believe they meet our articulated goals and will serve our students and our community well. Furthermore the proposed calendars are consistent with the proposed calendars in our surrounding communities. Sadly, there is nothing in this news story that is surprising to many of us. For several years now we have worked with families whose children have become addicted to prescription pain medication and/or heroin. We’ve lost several Worthington graduates to this epidemic. What we’ve learned through working with these families is that addiction can happen to anyone. The families affected by this addiction are “good” families who have “good” kids. Unfortunately, once addiction begins it is very, very difficult to overcome. As a school district we have worked to be proactive in our approach to educating students and families about opiate abuse. We have partnered with organizations such as “Drug Safe Worthington” to bring in speakers for our students and families. We’ve hosted “Tyler’s Light” and “Operation Street Smart” multiple times in order to better educate our community. Several years ago we partnered with the Worthington Police so they could implement a prescription drug drop box so residents could easily dispose of pain medication (this is critical as most opiate addiction begins as prescription pain medication abuse found in family medicine cabinets before escalating to heroin). 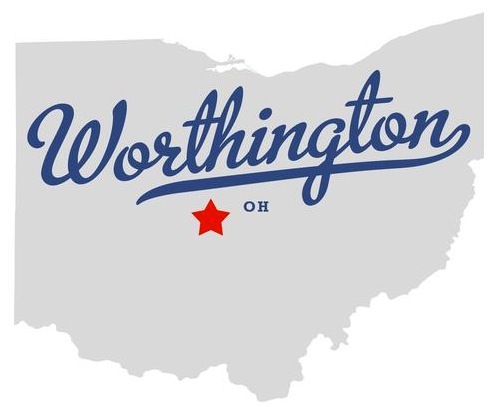 Several years ago Worthington devoted a full-time teaching position to working with our students and community to help them remain drug free and to help decrease bullying in our schools. Lori Povisil (lpovisil@wscloud.org) works in this capacity to coordinate student-led initiatives to live drug free. In addition, she teaches parent education classes called “Insight” in an effort to allow parents to partner with their children to make good choices. And, over the past three years our school district has added three mental health specialists that work to connect students and families to positive resources before students turn to substances. Finally, just last month we made the decision to partner with local law enforcement to bring drug sniffing dogs into our schools. All of these efforts are important and part of a comprehensive approach to helping our students. As a school district we will continue to be diligent. 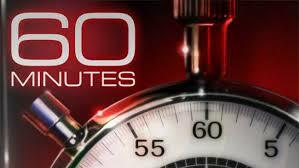 The 60 Minutes story sheds light on the fact that heroin is a problem in our community and in every community like ours across the nation. I’m proud that a graduate of Worthington Kilbourne High School had the courage to speak to 60 Minutes and I’m hopeful that this story, and that courage, will spur others to have open conversation about addiction and abuse. As a community we must partner together to help keep our kids safe.